For 30 years, the New Jersey State Bar Foundation has been awarding scholarships to worthy students, entering their second or third year at a New Jersey law school. The criteria for the selection of candidates include academic excellence (grade-point average and class standing), participation in extracurricular activities, financial need and community service. We award up to nine scholarships each year. Of these, the State Bar Foundation bestows one scholarship to a student in each of New Jersey’s three law schools: Rutgers University School of Law—Newark; Rutgers University School of Law—Camden; Seton Hall University School of Law. In addition, the Justin P. Walder Scholarship is awarded to a student who meets the above criteria. Five additional scholarships have specific criteria. The Wallace Vail Scholarship is given to the candidate who achieved the highest academic performance among the three law schools. 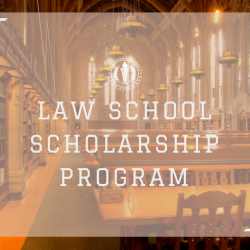 The Labor Law Scholarship is earmarked for a student wishing to enter the field of labor law. In addition to the criteria mentioned above, particular attention is given to academic achievement in the area of labor law. In addition to the above criteria, the Sonia Morgan Scholarship is awarded to a female student. The Abram D. and Maxine H. Londa Scholarship was awarded for the first time in 1996-97, and, in addition to the above criteria, gives preference to a student from Union County. The Scarinci Hollenbeck Scholarship is open to a student who demonstrates a commitment to the advancement of LGBT issues. Applicants need not be a member of the LGBT community. Scholarship applications are available at the beginning of the second semester at the financial aid offices of the New Jersey law schools. The Foundation’s Scholarship Committee meets in early May to consider the applications and make the selections. If you have any questions, please contact NJSBF Director of Grant Programs and Administration Cynthia Pellegrino at 732-937-7507 or via email at [email protected]. For a closer look at our scholarship program watch this short video.